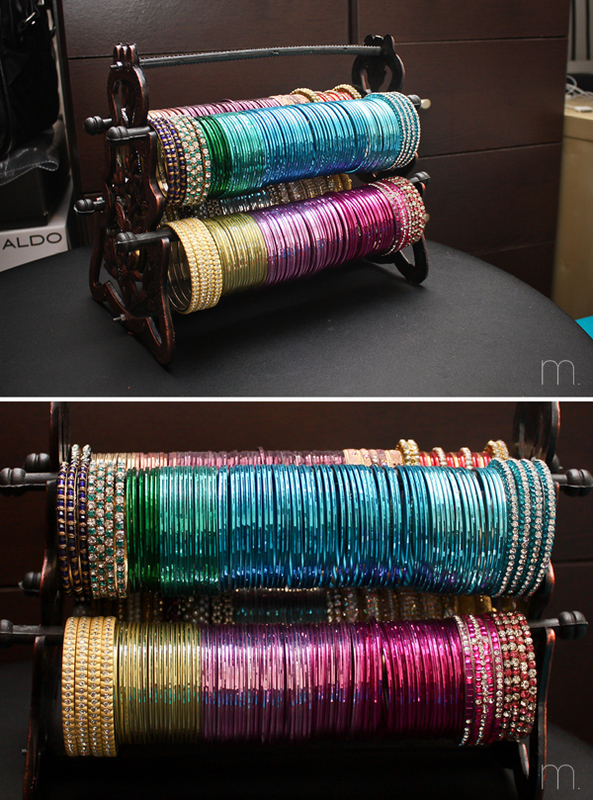 So here is my bangle/churiyan rack, the start of me doing posts on my jewellery & accessories. I've collected these over time.. however most of these I bought just after I got engaged (3 years before I got married) and matched them to my desi suits. I think I have all the colours I need at the moment. If not I tend to just wear the bigger sparkly ones to match the colour embroidery on the suit, which tends to be gold/silver. As you can tell a lot of my desi bangles are from Head Over Heels. 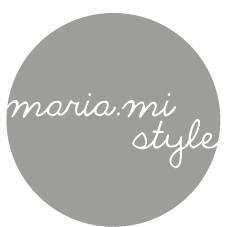 If you haven't been then it is on Wilmslow road in Manchester and if you're in that area needing to match some bangles I would definitely recommend them. I have never had a problem trying to find a specific colour & the owner also makes a lovely set infront of you to match the outfit you have. Finally the rack itself was a present my mother in law bought me from Pakistan recently. 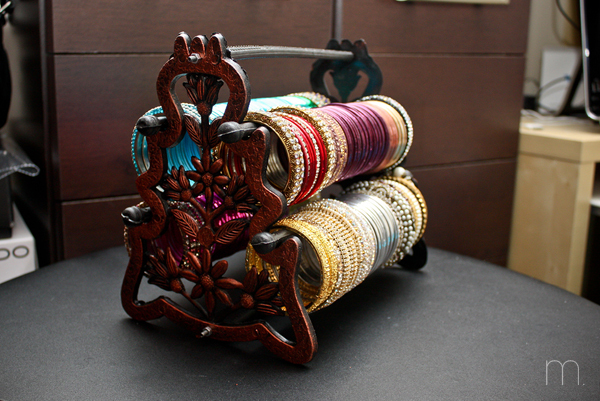 I have been wanting one for ages, I love the look of my bangles on a rack. I have been trying to find one that is acrylic that is a decent price. If you come across any please do let me know, would really appreciate it! 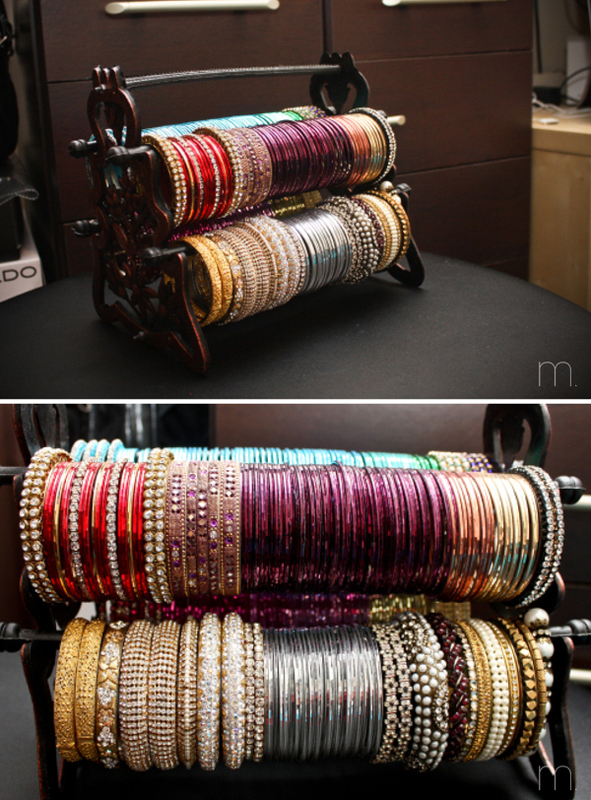 Such beautiful bangles :) I have some same/simuler ones but I am impressed by your extensive collection. Ahh, I didn't think I had that many? Guess I'm comparing to my cousin who has probably 2 or 3 sets of the amount I have.. should have taken a pic when I was down in london! Bit of a personal question, I wouldn't like to share my private affairs i.e. husband/family on my blog. I love this! I left my chooriyan collection at my parent's. Don't really wear desi clothes nemore :(. Would love to start...but need to wait for prices to come down. Could mix them with non desi clothes too? I just went back to my mums yesterday and bought back a whole load more churiyan! I love your collection, and I can completely relate to only wearing the bigger bangles to coordinate with the embroidery. Sadly, gone are the days of bothering to stack bangles upto elbow lengths! If you do discover an acrylic storage system for bangles, please ensure you post about it. 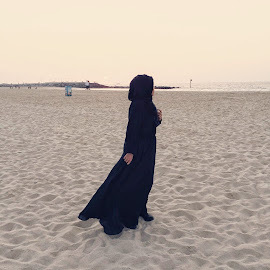 Sorry for the late reply, will post that sometime this week insha'allah.